By the house patio is small memorial garden, in which Jeremy the cat has her final resting place. In it I've planted some of my favourite foliage plants like variegated Miscanthus, as well as roses. Jeremy the cat may be long gone, but her garden still evokes happy memories. 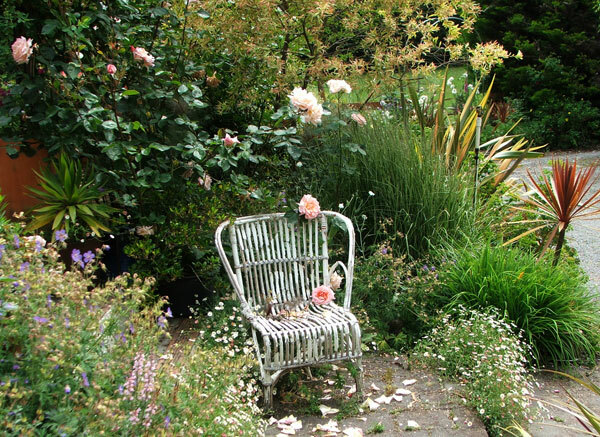 My white cane garden chair is purely for decoration, though I've been tempted! It's most useful for putting my garden tools on - so they won't get lost. Jeremy has her own special page in my cats and dogs section. Dear Jeremy was a rather timid cat, and this garden area was almost as far as she would venture from the house. She was one of the earliest Moosey cats to depart, so to speak. 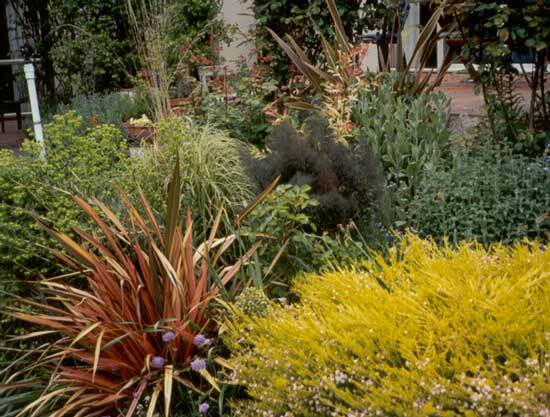 Below is an early picture of Jeremy's memorial garden, taken when the little red flax (a compulsory feature of my early garden designs) was indeed a little red flax. Alas this is no longer the case - but it is still there. Gardens do change, and that original little red flax has now turned into a large non-red variety. Like the cat, the Breath of Heaven is dearly departed! And Jeremy had an original memorial rose which became rather smothered by bronze Fennel. Oh well - such is garden life!